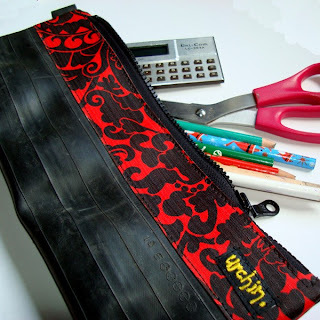 It's hard to make an old bike tube look good, but Urchin Bags sure knows how to do it. The company combines fashion, passion and functionality to create some really great bags out of used inner tubes and scrap vinyl. Choose from several different styles ranging from gym and messenger bags to this one called the Peata Pocket. Combine it with this bicycle greeting card from Skeese Greets for a unique gift for your favorite female cyclist.